With globalization flattening the world, it has become increasingly important for companies to utilize outsourcing firms in India to stay competitive. India is the best outsourcing destination for technical work, when compared to other outsourcing locations in Eastern Europe, the Pacific Rim and Latin America. Here are seven reasons why your company must seriously consider outsourcing to India. Almost every business is under constant pressure to produce huge volumes of work and generate more revenue with their existing staff. By outsourcing to India, you can use your current staff to manage the outsourced team and projects, thereby increasing the output of each member. 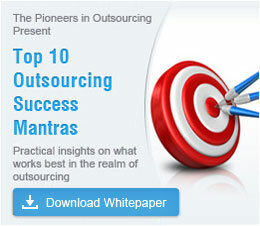 Only outsourcing to India can result in a marked improvement in your company's productivity. American labor is expensive, since the cost of living in the US is high when compared to other countries. As an employer, you will be for paying for taxes, computers, cubicles, health insurance and liability insurance, in addition to each staff member's salary. When you outsource to India, you can cut down on the cost of labor drastically. The range for a skilled developer in the US can be anywhere from $50 to $80 per hour, while the hourly cost of an experienced developer in India can be negotiated down, to as low as, $15 per hour. India's pricing flexibility enables you to more creative in managing your budget when your company cannot afford to pay high salaries. Make a decision to outsource to India and witness a marked improvement in your productivity, profit and net income. Get in touch with us to start outsourcing to India.